Ascending Empires is an oddity. 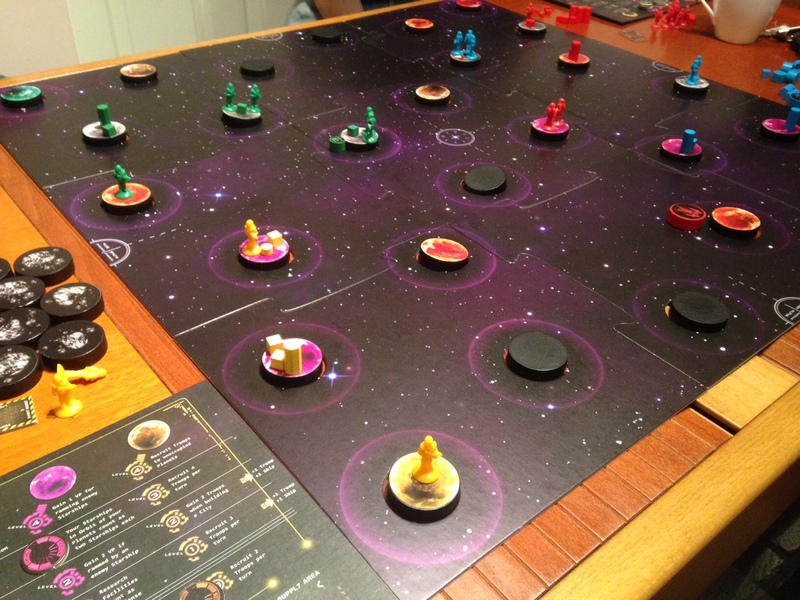 It’s a 4x space game with and unusual movement technique…. You flick the pieces to move them. That’s right it subbuteo in space. OK you’re first thoughts are this is dumb until you sit down and play a game. It’s really really good. Play this game if you get a chance. I’ve had it at Knavecons and its proved itself a minor hit. 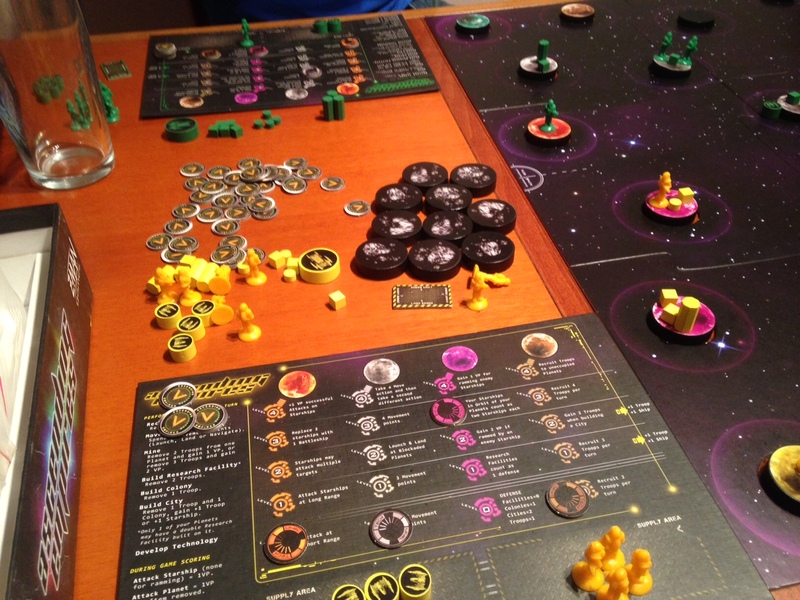 The game sees you and up to three chums expanding out from your initial home planet with a growing murder of ships and troops, colonizing and more importantly defending planets which come in four different colors. It’s like a condensed version of Twilight Imperium, all in, in under two hours. The flicking mechanism is subtle. It’s not Rampage. You won’t end up flicking pieces off the board. It’s way more interesting than that and it works so well. It does add a random element but rarely a game ruiner and I’d take this over dice rolling any day. Well at least in this game. Depending on what planets you grab you can tech up different paths and getting to the top of any of these gives you near apocalyptic abilities. 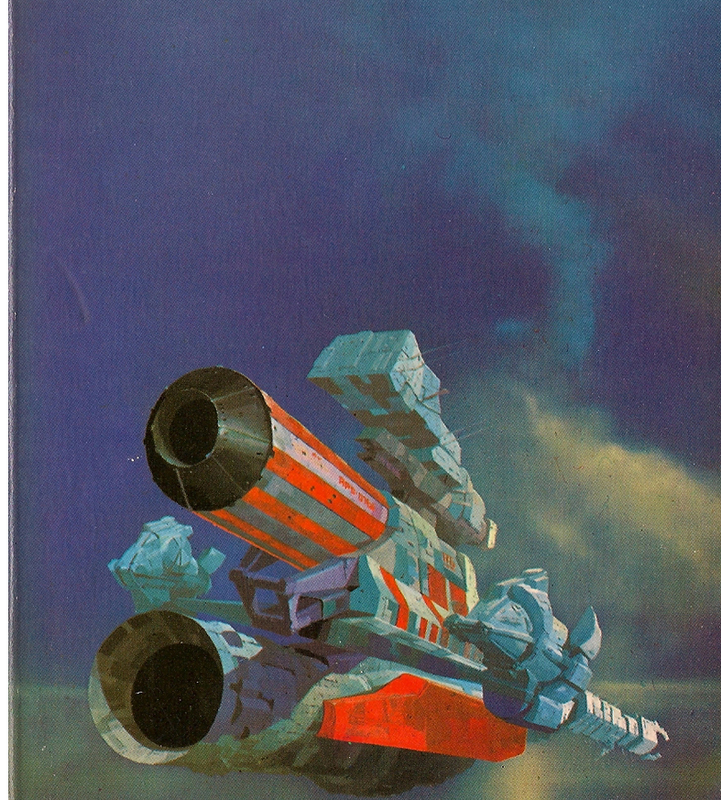 Everything you would expect from a space game are in there. Exploring unknown worlds so you can grab resources and build more stuff. Epic space battles. Well the battles tend to be small scale but no less heart stopping. Back stabbing (my group would back stab at snakes and ladders if it could), researching tech so you can lord it over the other cave man like empires. Compared to other games of its type this is a fast game. It certainly packs in a lot during it’s playtime. There’s also very little downtime. I can see why they stuck to four players. Any more would drag the game too much so four is bang on.